Danse Danse. Photo by Jeremy Mimnagh, courtesy of The National Ballet of Canada. Guillaume Côté and Kathryn Hosier in Spectre de la Rose. The 2015-2016 season of Danse Danse kicked off last night at Théâtre Maisonneuve with a stunning contemporary triple bill from the National Ballet of Canada. From the quasi-ironic classicism of William Forsythe to the petulant freneticism of Marco Goecke to the stark power and melancholy of Wayne McGregor, there was something to satisfy every modern taste. Danse Danse. National Ballet of Canada. Photo by Cylla von Tiedemann, courtesy of The National Ballet of Canada. Sonia Rodriguez with Artists of the Ballet in the Second Detail. The evening opened with Forsythe’s The Second Detail, featuring monochromatic sets and costumes: grey was the order of the night, from the dancers’ outfits to the metal chairs lined up in a row at the back of the stage to the monotone back wall. Pulsing electronic music provided the perfect backdrop for a hyper-classicism with roots deep in ballet, but branches pointing at the fashion runway, body builders, Riverdance (remember them? ), and schoolgirls. Extremes of elegance in motion were set off by the rigidity of sitting still on a chair, women with knees together, men with knees apart; the artifice of classical ballet was highlighted by the calculated striking of poses; the fluidity of motion in three-dimensional space contrasted with the stasis of moving hieroglyphic friezes. Towards the end of the work a woman in a flamboyant white dress made her way behind the chairs and finally onto the main part of the stage, and in so doing sent the precision and symmetry of the work into a whirlwind of chaos, exposing the circus-like freedom underlying—or perhaps threatening—the classical order. In Marco Goecke’s remake of the classic Spectre de la rose (originally performed in Paris by the Ballets russes in 1911), the music is classical, but the movement far less so. Bearing an odd resemblance to hummingbirds, seven male dancers and one female tremble and vibrate, arms darting in all directions, forming impossible shapes. Other creatures are sometimes implied: dogs, for example, when each of the male dancers enters in turn, making rhythmic panting noises while sidling up to their assigned spots on stage, and children, when the sheer joy of jumping informs crazy anti-balletic leaps and turns. The overall effect is often one of marionettes, or cartoons, as the dancers exaggeratedly feign conducting motions when the orchestral music swells, or when the virtuosity of isolating and combining head, shoulders, chest, and hips challenges our understanding of anatomy. Danse Danse. Photo by Bruce Zinger, courtesy of The National Ballet of Canada. Piotr Stanczyk with Artists of the Ballet in Chroma. The last piece, McGregor’s Chroma, is a series of stark tableaux. The sets and lighting are integral to this work; sometimes the white is so bright it’s blinding; the oh-so-pale colours of the dancers’ outfits stand out in sharp relief against the extreme whiteness of the backdrop. Bodies collapse in on themselves and open back up again; movements are sharp and often sexual. Combined with the music, the effect is supremely powerful. The moods range from stentorian to melancholic, Neolithic to nonchalant, but always very intense, bristling with energy. Even the dancers who stand immobile, their backs to the audience, exude a presence that will fill the empty space once they start to move. If the rest of the Danse Danse season lives up to the National Ballet’s opener, it promises to be a great year for modern dance in Montreal. 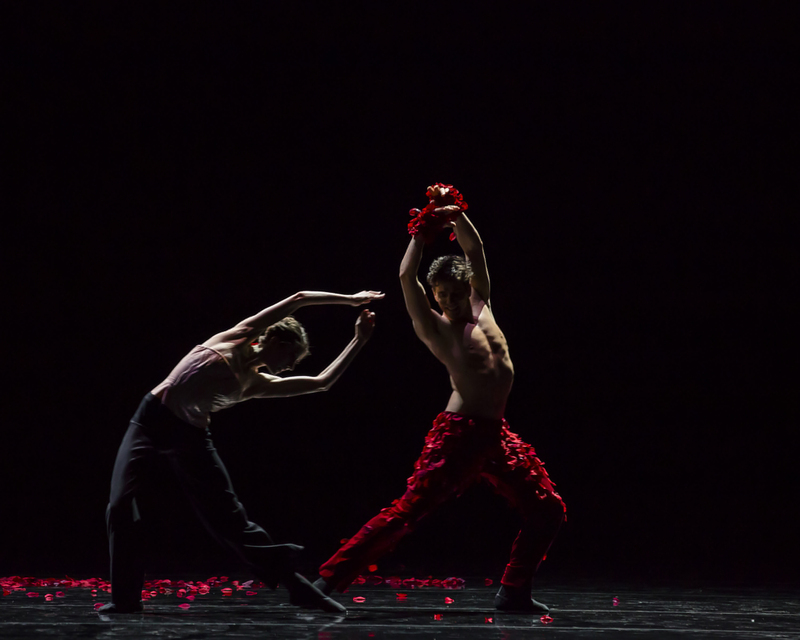 The National Ballet’s the second detail (William Forsythe), Spectre de la Rose (Marco Goecke), and Chroma (Wayne McGregor) are at Theatre Maisonneuve on Oct 1-3 at 8 p.m. $46.50. For more upcoming Danse Danse shows, their website is HERE.